Figure C-2 in the color insert, shows an interestingly shaped color blob with a numbered curve and a brighter triangle embedded in it and some numbers around its curved edge. The blob represents the complete range of hues and saturation levels that the human eye can discern; a true spectrum would wrap around the numbered edge (albeit without the cyan region near the upper left). The middle is composed of smoothly interpolated mixtures, including ``white.'' 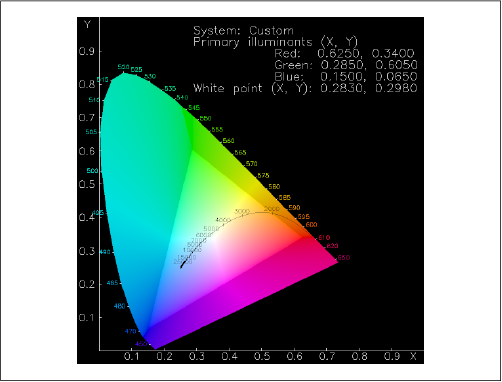 The numbers on the axes give the x and y values of each hue and are directly related to the International Commission on Illumination's (CIE, for Commission Internationale de l'Éclairage) XYZ color space, a standard and device-independent color space for well over half a century. We'll come back to that shortly. Because the diagram has been projected down from a three-dimensional color space (XYZ) to the two-dimensional xy plane, information about the relative intensities of red, green, and blue has been lost. That is, the x,y values for the red phosphor indicate what color it emits at any given intensity level and similarly for the green and blue phosphors. But we still need to know the relative intensities of the three phosphors when they are all at full power. This is where the concept of ``white'' comes in. In fact, there are many candidates for ``white,'' from the warm, yellowish whites produced by incandescent lightbulbs to the cool, bluish whites of electrical arcs and lightning. The curved line in the middle represents all possible values of ``white'' for a given monitor, only one of which will be displayed as such. The associated numbers along the curve refer to the ``blackbody temperature'' or color temperature of any given white value; among other things, a star whose surface (photosphere) is at the given temperature will emit light of the given color most strongly. Our Sun's surface temperature is around 6,000 degrees Kelvin, for example; not coincidentally, this is the color temperature most humans associate with ``average'' or ``true'' white. It is slightly odd that humans perceive redder light as ``warm'' and bluer light as ``cool'' when, in fact, the opposite is true. Lightning is far hotter than the filament in an incandescent bulb. Keep in mind that we are still talking about human perception. A blackbody emits a true continuum of light; a monitor emits a more limited continuum composed of three broad, overlapping curves--corresponding to the red, green, and blue phosphors. Humans perceive the monitor's ``white'' output to be the same as that of a blackbody at a particular temperature, but a spectrometer would say otherwise. The simple way to deal with such conversions is to feed the information to a color management system (CMS), assuming one is present. All of the tricky details of conversion between different color spaces and of mapping different monitor gamuts are handled by the CMS. Color management systems are not yet in wide use on typical users' platforms, however; a decoding application that wishes to maintain optimal color fidelity will need to handle the conversions on its own. The calculations to do so are not terribly difficult, but they do involve a number of matrix operations. These are detailed in of the University of Manchester's excellent tutorial, Colour in Computer Graphics, and also in the "Color Tutorial" section of the PNG Specification, Version 1.1.